We are holding a consultation on the ASEAN Charter as Article 50 of the Charter stipulates that the Charter be reviewed 5 years after its entry into force. The Charter is the fundamental document, a governance code, a code of conduct if you like, in ASEAN. 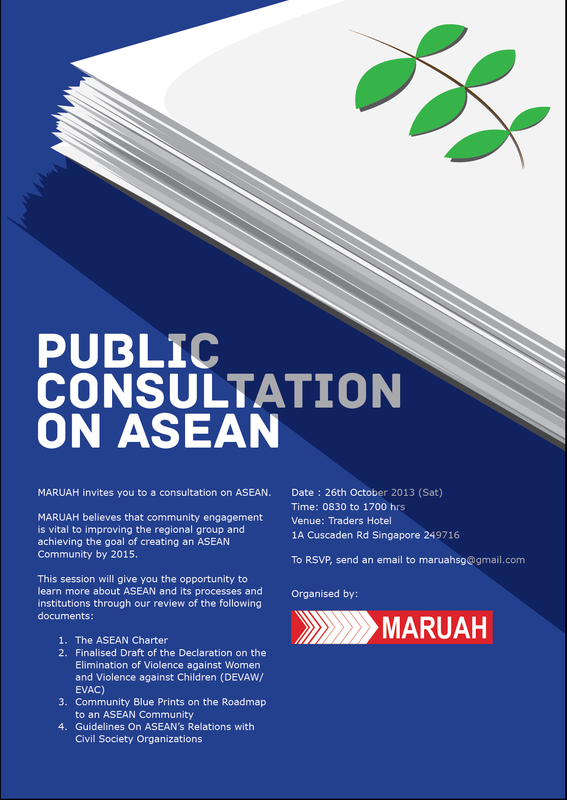 MARUAH believes that the review is necessary to improve and strengthen the regional group, its processes and institutions to serve the people of ASEAN better. A review of the Charter also gives us the opportunity to take stock of our progress towards the goal of an ASEAN Community by 2015 and Member States’ commitment to the values enshrined in the Charter. The consultation will be run as a full day seminar with breakout discussions, presentation and sharing sessions. For some do not be afraid of ASEAN or wonder about its relevance. Treat this as an introduction to ASEAN if need be. This entry was posted on Saturday, October 5th, 2013 at 12:59 pm and is filed under ASEAN, Events. You can follow any responses to this entry through the RSS 2.0 feed. You can leave a response, or trackback from your own site.